Located in Jackson, Mississippi, the Mississippi Agriculture Museum is a recreated living history farming town, featuring an agricultural aviation museum, a 1920s-era cotton production town, and a variety of educational exhibits on farming and transportation technologies. 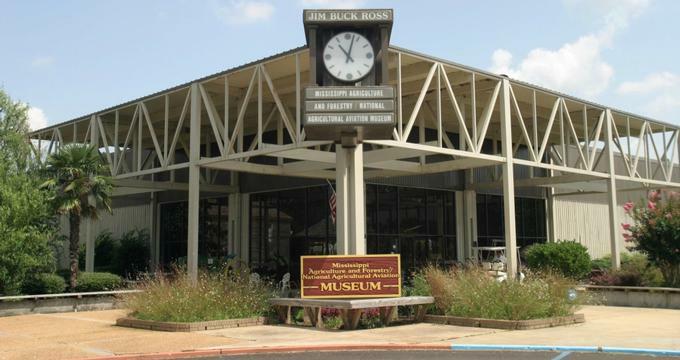 The Mississippi Agricultural Museum was the vision of Agriculture and Commerce Commissioner Jim Buck Ross, who began an initiative to collect artifacts and organize scholars in the hopes of creating a museum facility to educate Mississippians on the history of the state’s agricultural industry. A 39-acre site for the museum was donated by the City of Jackson in 1978, under the stipulation that the land could only be used for educational and recreational purposes, and the same year, $1.5 million in funds was approved for museum construction by Mississippi state legislature. Government funds were matched by private donations raised by the newly-formed Agriculture and Forestry Museum Foundation nonprofit organization. Today, the Mississippi Agriculture Museum is owned and operated by the Agriculture and Forestry Museum Foundation and serves as an educational resource communicating the past, present, and future of agricultural lifestyle and industry in the Mississippi area and the Southeastern United States. The museum complex spans 39 acres and includes a fully-recreated Small Town Mississippi 1920s-era village, serving as a replica of typical Mississippi cotton farming towns during the post-Antebellum period. A variety of businesses typical of early 20th century towns have been created for exploration, including the TBZH Print Shop, the Small Town Blacksmith shop, a gas filling station, and a general store. Social services such as a doctor’s office, church, and one-room schoolhouse are also featured, along with a grist mill, sawmill, sugarcane mill, and a replica of the Bisland Cotton Gin, which operated in nearby Natchez until 1954. A masonic lodge recreation and cultivated rose garden are also available for exploration. The museum’s Heritage Center serves as its main entrance point for visitors and features the National Agricultural Aviation Museum, a 5,000-square-foot exhibit center chronicling the history of agricultural production through the development of aviation technologies supporting the industry. The museum is supervised by the Washington, D.C.-based National Agricultural Aviation Association, which moved its facilities to the Mississippi Agricultural Museum in 1980. A photo wall displays photographs of members of the National Agricultural Aviation Hall of Fame, including its three Mississippi members, Jess Orval Dockery and Aubrey and Jimmy Finklea. Important crop dusters and aviation aircraft are displayed, including the Stearman A75 Biplane, constructed during World War II, and the 1946 Piper J3, formerly used as a flight school training aircraft before being converted into a crop duster model. Also included in the Heritage Center is the Mississippi Agriculture and Forestry Museum, which highlights agricultural technologies using water, railroad, and road vehicles. Two model train exhibits, an HO Scale Layout and an O Gauge Layout, are included in the museum’s railroad section. Behind the museum, the Fitzgerald Collection exhibit showcases the collected memorabilia of Frank Stanley and Erva Mae Fitzgerald, who accumulated a large collection of Mississippi Delta artifacts from local antique stores, junkyards, and auctions. Highlights of the collection include more than 17,500 Native American artifacts, a large collection of vintage and antique toys, and a 7,000-piece pencil collection listed in the Guinness Book of Records. A number of natural areas are also highlighted within the museum complex, including the museum’s Nature Trail, which educates visitors on the relationship between farmers, the agricultural industry, and the environment. The 300-yard trail runs through 10 acres of hardwood, pine, and cypress forest area along a creek bed, featuring a variety of exhibits detailing information about native trees and plants. A nature pavilion offers opportunities for visitors to relax and observe, and picnic tables are also provided at several points. Additionally, a Specialty Crops Victory Garden features 17 raised beds with seasonal and specialty plantings, along with a worm composting station, and offers education on conservation and cropping techniques. Guided tours of the Mississippi Agricultural Museum are offered for elementary and secondary educational groups, tailored to Mississippi curriculum standards. Self-guided audio tours of the facility are also available, along with a detailed map of the museum’s exhibit areas. Carousel rides on the museum’s classic 1928 carousel are offered Monday through Saturday for a nominal fee. On the first Thursday of every month, a Story Time with Uncle Story event is presented, showcasing agricultural and forestry-related stories read by the museum’s mascot puppet, Uncle Story. Other special events held throughout the year include an Easter egg hunt, a Pumpkin Adventure festival, a Spring Farm Days event, and a Country Christmas celebration.